Posted byPhil Larson	 August 7, 2013 August 7, 2013 1 Comment on Are you a PMO or a PCO? Entitlement breeds discontent. There really is no productive way to look at entitlement. Don’t read this if you like entitlement organizations. Don’t read this if you enjoy getting something for existing. Business, NGO, and government must face the question. Are a PMO or a PCO? PMOs proliferate under social thrusts. The easy part of being a charitable organization is asking people to give for compassionate repair and reparation and life needs. Food, clothes, housing, and basics are all needed. People will give to maintain a certain level of poverty in another’s life. Poverty is the mentality that there is never enough resource and my efforts will never be rewarded adequately. Poverty is a codependent focus instead of an interdependent cooperation. Poverty is not an economic condition. Lack of economic resource is a result of poverty mentality and living. Societies and organizations that promote systemic adaptation to low rewards encourage economic, moral, and mental poverty. PMOs proliferate under corporate mentality. Oops, you thought this was about charities. Any business that purses entitlement mentality of ‘get the minimum done to get paid and get benefits’ is as life force destructive as a charity giving out groceries to people who need growth. Businesses that emphasize fun and frivolity and fairness and equality usually end up with a work force bent on work avoidance and entitlement expectation. Those are all good things. They need to be built alongside productivity and profitability. After all business is about a fair return on investment. Jobs happen when profits happen. PMO is the way of life of the government. Government consumes more and more of the community resource as laws get added and modified and bureaucracy grows and grows. It is impossible for all the government entities to pay off the exorbitant early retirement programs that are inequitable and inconsistent with business productivity. More and more cities, states, and nations have reached bankrupt points of no return. PMO. How do you become a PCO when you are a PMO? 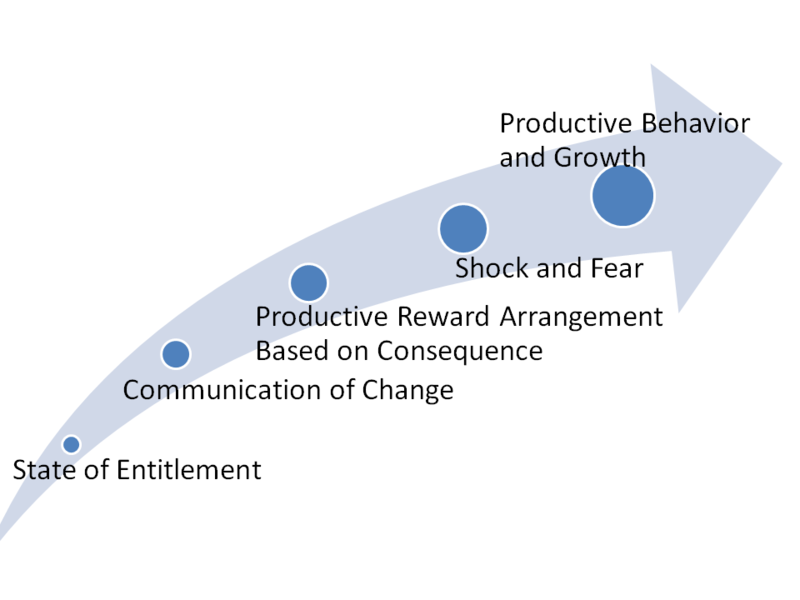 Positive change organizations proliferate under reward and recognition. Now, reward and recognition do not mean everyone gets the same dole or the longest tail gets the biggest piece of the pie. In a PCO, reward comes in relation to present contribution not position or power or political expertise. In parenting theory we call that love and logic. Raising children in a positive environment keys on establishing positive and negative consequences for behavior. Reinforce that environment consistently and a productive citizen is formed. Oh, that is also a great system for correction systems and addiction recovery. Entitlement is an addiction. I used to believe nicotine was the hardest addiction to break. Entitlement is tougher. So how do you change from PMO to PCO. This little graphic maps the path. Document the state of entitlement. Confront the facts. Identify where behavioral consequences are missing. Quantify the cost to your organization of death by indecision. Decide which battles you are willing to fight. Any reversal of entitlement will be met with violent resistance and revolt. Better to build with encouragement and consequence systems, but PMO happens. So be real and be honest. Communicate change repetitively to those involved. Give plenty of lead time to the change but not so much that griping and groaning have time to build barriers. That is a fine balance. Start rewarding productive behaviors before removing entitlement doles. This won’t change anything, but it will establish a new thought pattern in those affected. It might have been so long since they had positive reward for productivity that they have forgotten what dignity feels like. Entitlement strips dignity and inner drive. Dignity based on reality has to be instilled fresh. Move to consequence and positive reward. You might find this difficult. Your management team may have no idea how to identify positive and productive behavior. They are used to promoting entitlement and systemized to zombie workplace. Dilbert might be their favorite cartoon for a reason. Of course, as the executive leader admit your guilt in leadership. You will have to change, too. The greatest failures of organizations wanting to make this move is that top leadership credits the workforce for being more powerful than the executives and blames them instead of the mirror. Truthfully, it takes combined efforts of management and work team to enter entitlement and to exit entitlement. Measure Shock and Fear. This will be large. Get ready. Get poised. Backbiting, blaming, and bickering will explode. But it will pass if you hold ground. Keep focus on where you are going, encourage the afflicted, and do not let this stop you. If you stop here, you will find it doubly difficult to work on this in the future. Many companies sell out at this point and leave the issues for the new owner. They may scuttle great managers and executives as sacrifices to the masses. Don’t doubt in the dark what you know in the light. Keep moving forward. Plan to run. Run the plan. Productive Behavior and Growth. Here is where you land. Here is where you focus. Here is where you want to be. The Positive Change Organization promotes, inspires, and realizes productive behavior and growth. Not everyone can exist in this environment. Yes, you may lose some people you had believed to be key. Not everyone wants to change. Try to salvage them, but don’t sink productivity in the process. New leaders will rise. They’ve been poised for this new environment and potential was shadowed in the old system. Now you can see them. PMO or PCO? You decide every day with every decision what environment you wish to build. Reblogged this on The Community Transformation Initiative.